Miriam has not one but FIVE favourite things to share with you today! Be impressed! I am!! 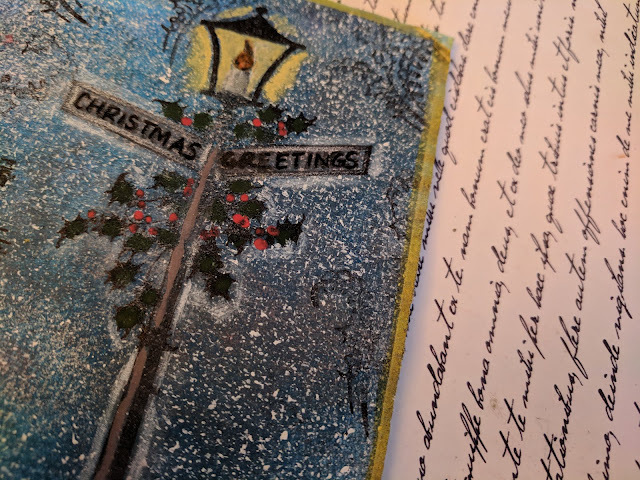 Hi everyone, it's Miriam here from Miriam's Creative Dreams with you today, and I'd like to share with you a card created using 5 of my favourite things. When I was asked to create a project using my favourite things I couldn't narrow down the number of favourite things that I have! The thought of putting some of these into a project really excited me, and it was really enjoyable to create. So, here is my completed project. What are my favourite things?? 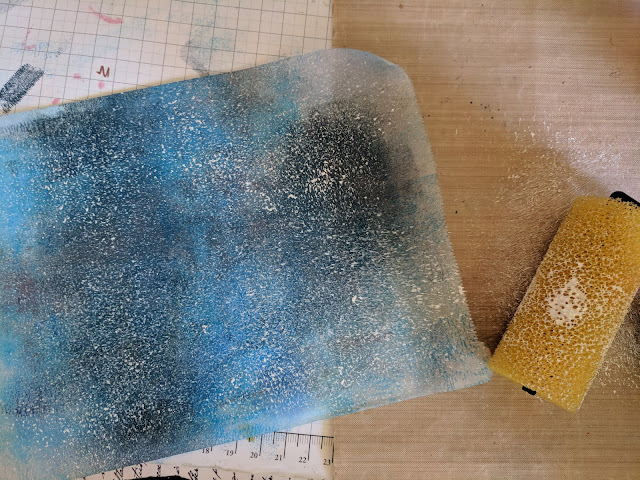 Firstly, and most importantly, PaperArtsy Fresco Finish chalk paints. These paints are so versatile and so creamy and enjoyable to use - whether I am painting using a brush, or brayering as I have done for this project. I use these paints in almost every project I create. My second favourite thing has to be texture - of any form! For this project I used a textured brayer to layer Snowflake Fresco Finish Chalk paint onto the painted tissue. This not only created amazing texture but also reminded me of snow. For my third favourite thing, it just had to be Hot Picks stamps. Since the day they were released I have never been able to get enough of them. They are always a 'go to' stamp for me - and totally my 'type' of stamp. 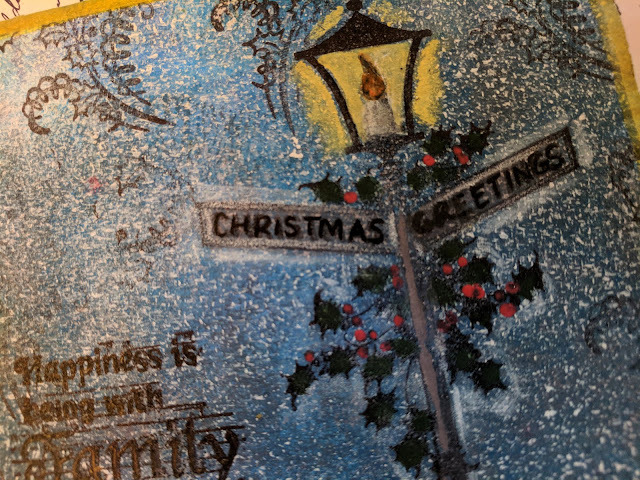 For my project I chose to incorporate this with my 4th favourite thing - Christmas - and so I used one of the amazing Christmas sets. These stamps are so useful - they create stunning cards and can be used in simple and more complicated projects. For my project I kept the images simple. I used the great holly flourish to stamp around the edges of the card. 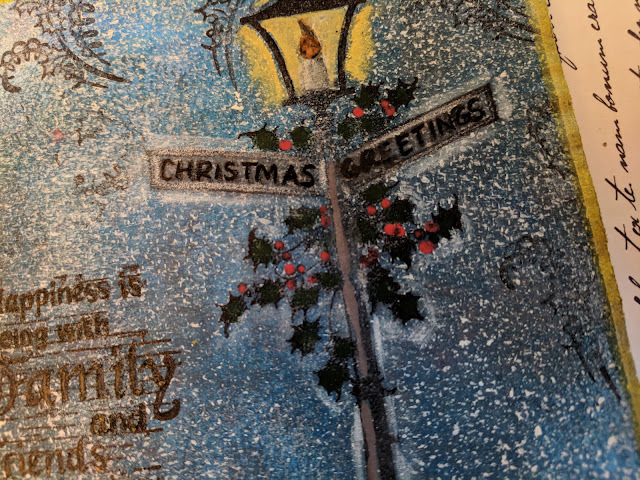 The lamp post was stamped using Archival Ink (Jet Black) and then coloured using Haystack, Autumn Fire, Cherry Red and Hyde Park Fresco Finish chalk paints. The lamp post was then highlighted using a white pencil. The sentiment was stamped in Archival ink. To finish, the card was edged using a gold marker. So what was my fifth favourite thing?? Well, it just had to be the colour blue. I use blue a lot. So, these are a few of my favourite things (I dare you not to be humming the tune by now). I really enjoyed creating this project. I loved combining products and themes that make me happy and putting them all into one project. Whilst the blue made the card quite 'dark' it reminded me of a winter's night - with snow falling and the dark streets being lit by lamp posts decorated in Christmas lights. I really hope that I have encouraged you to create a project using some of your favourite things. Thanks for joining me this evening. I really hope that I have inspired you to create! I wish you and your families a very Merry Christmas. As this is the final topic of the year, there is not a challenge as we know you are all super busy, so sit back, enjoy and be inspired. 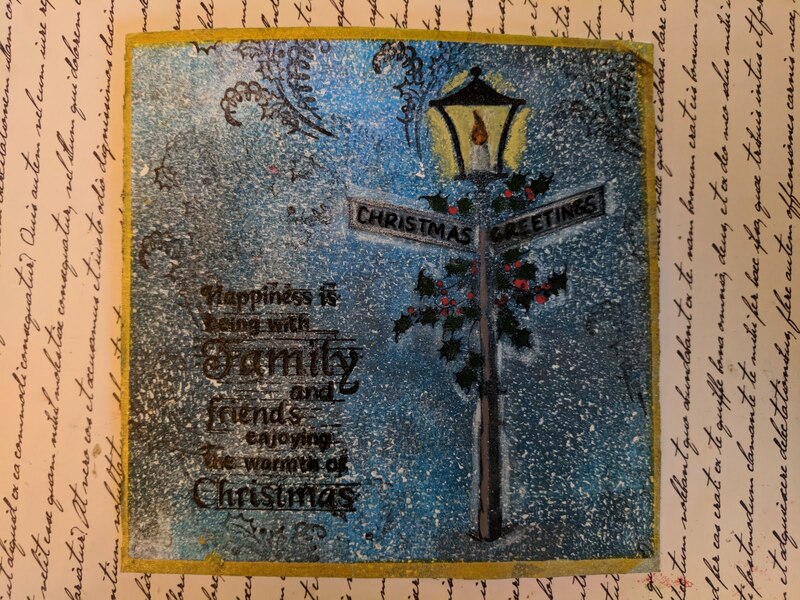 Beautiful use of those stamps Miriam, love the sparkle/snowy look to your background. This is gorgeous, miriam, i love the way you have coloured the lamppost! I just love this stamp set! What a beautiful creation. This is so beautiful and dreamy. What colours did you use for the background (apart from snowflake) please? Love your card, Miriam!!! Really beautiful!!! Love this Miriam and you used my favourite PA Christmas stamp set. I've made several cards with the lamp this year. Love your snowy night sky background on your gorgeous card.